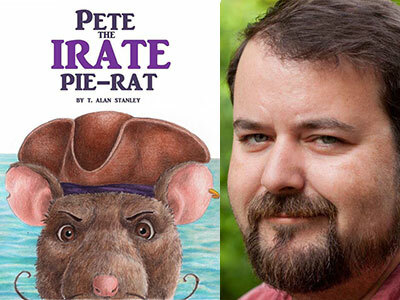 BROWNSVILLE, TN (NOVEMBER 20, 2018) – When Pete, the pie-rat’s pies go missing, he sets sail on a global search to find them in the pages of T. Alan Stanley’s, Pete The Irate Pie-Rat. Stanley both authored and illustrated the story of Pete and will visit the Delta Heritage Center in Brownsville Saturday, December 8, for a book sale and signing. The event begins at 1 p.m. and includes a special guest appearance by Santa. Stanley, known as Travis to friends and family, is a native of Brownsville who now resides in Clarksville, Tenn. He is a graduate of Haywood High School, Austin Peay State University and Savannah College of Art and Design. He has been an art educator for the last decade and spends his free time drawing, writing and making the occasional portrait commission. He is the son of Larry and Sheila Stanley and has been married to his wife, Heather, for 19 years. Their daughter, Lena, is a high school freshman. Pete The Irate Pie-Rat is his first book. Stanley will read from his book and talk about Pete’s adventures beginning at 1 p.m. As a special treat for the children, Santa will also make a guest appearance. Attendees will enjoy samples of blueberry, apple and pecan pie cookies served with juice, milk and hot chocolate. The event is presented by the Delta Heritage Center and Brownsville Arts Council. There is no admission charge and books will sell for $15. For more information, please contact the Center at 731-779-9000.